Installation view of Victoria Cabezas and Priscilla Monge: Give Me What You Ask For, Americas Society, New York, February 13 – May 4, 2019. Courtesy Americas Society. Photo: OnWhiteWall.com. Victoria Cabezas and Priscilla Monge: Give Me What You Ask For, the current exhibition at the Americas Society, scatters moments of resonance between its two featured artists. The show’s framing foregrounds a few largely biographical overlaps, such as the pair’s shared national heritage, their respective spells in the United States, and their overarching professional marginalization. And yet, Miguel A. López, co-director and curator of San José’s burgeoning art space TEOR/éTica, where this show originated, smartly eschews an overly simplified or clean-cut curatorial premise, instead accentuating the differences that underlie their distinct modes of address. The outcome amplifies two of Central America’s most powerful voices, stressing Cabezas’s and Monge’s personalized interventions into gendered discourse, political violence, imperialist attitudes, and paternalistic views of their native Costa Rica. Priscilla Monge, Dear Priscilla, 1992. Thread on embroidered linen, 61 ⅜ x 41 ¼ inches. Courtesy Americas Society. One informal pairing in the opening gallery demonstrates the kind of fluid kinship implicit throughout the whole of the exhibition. 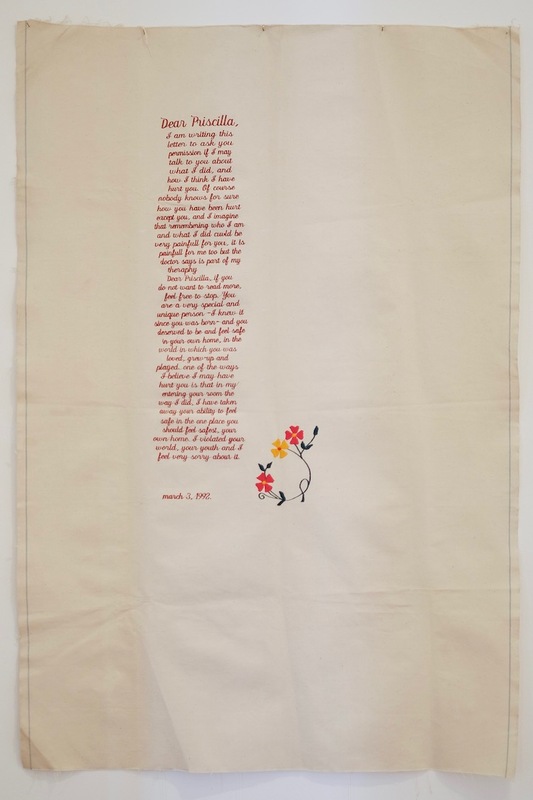 In Monge’s Dear Priscilla (1992), the title salutation opens an embroidered soliloquy. “I am writing this letter,” explains a repentant narrator, “to ask you permission if I may talk to you about what I did, and how I think I have hurt you.” The artist imagines an apology from her father for the lingering traumas of childhood sexual assault. “One of the ways I believe I may have hurt you,” the cursive text continues, “is that in my entering your room the way I did, I have taken away your ability to feel safe in the one place you should feel safest, your own home.” The heavy linen support for this script is largely blank, but for a delicate loop of blooming flowers: an insignia for rebirth. 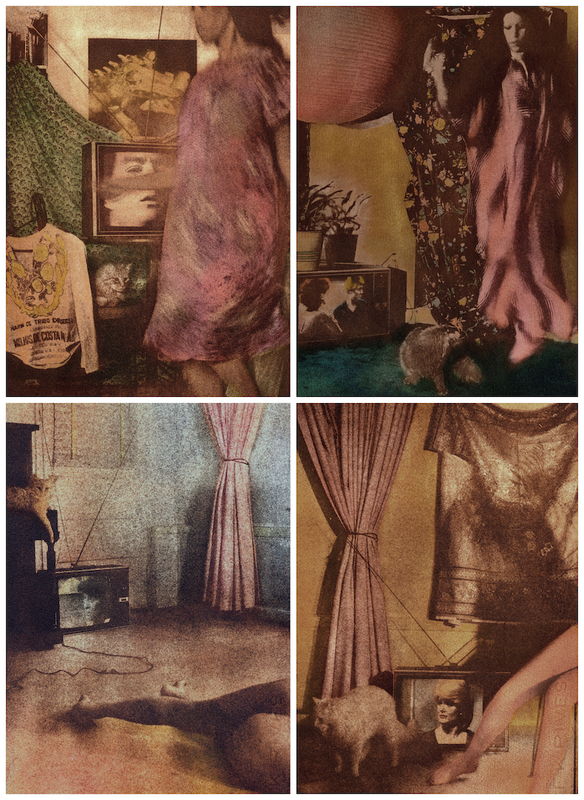 Victoria Cabezas, selections from the series Mujeres, gatos y televisores, 1983. Gum bichromate prints, each 9 ⅞ x 14 ⅞ inches. Courtesy Americas Society. Meanwhile, Victoria Cabezas’s performative photographs address the viewer from an adjacent wall. In one triptych from Mujeres, gatos y televisores (Women, Cats, and Televisions, 1983), Cabezas extends her bare lower body across a bed to stage a fragmented odalisque seen from behind. In another grouping, we see the nightgown-clad artist—or in some instances, just her outstretched legs—within the comfort of her apartment: a private but not inviolate sanctuary. Images of Gloria Loring and other soap stars populate a box television, suggesting this interior’s thoroughgoing penetration by mass media; and Cabezas, too, appears to be acting out a kind of melodrama, albeit one that serves to record her own agency and personal space. As with Dear Priscilla, with its careful needlework, Mujeres, gatos y televisores shows an artist reclaiming traditionally ”feminized” expressive means and codes to her own ends. Priscilla Monge, Dame lo que pides y pide lo que quieras, 1994. Oil on fabric, 86 ¼ x 52 inches. Courtesy Americas Society. The exhibition borrows its heading from Monge’s Dame lo que pides y pide lo que quieras (Give Me What You Ask For and Ask For What you Want, 1994), one of four paintings on fabric included in the exhibition. 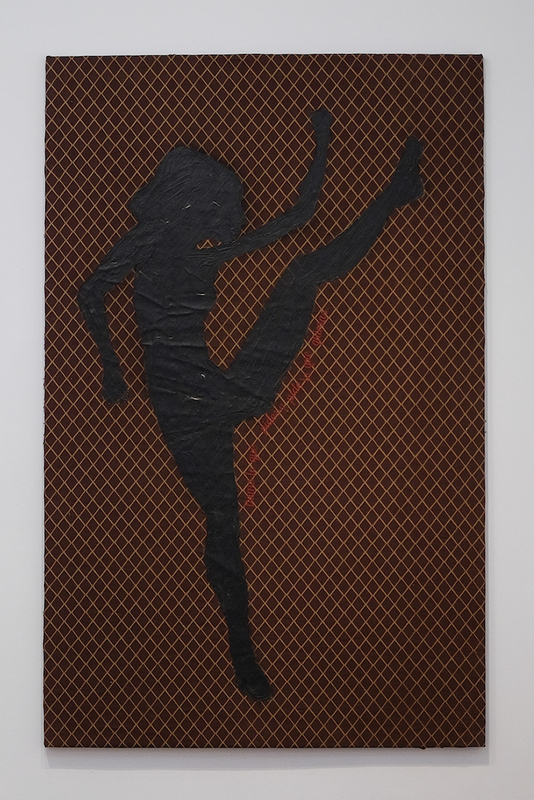 The silhouette of a female form, one leg kicked high into the air, sits on the surface with the glossy allure of an oil spill. The title phrase traces the outline of her thighs, stitched onto a textile reminiscent at once of men’s ties and of a chain-link fence. The figure’s exaggerated motion eludes a univocal reading: is she performing the splits or the can-can, delivering a defensive kick, or sparring with an unseen opponent? In other works from this series, Monge sets similarly uncanny figures against harlequin and leopard print fabrics, rearranging textile’s associations with female labor, costume, and cultural identity. Monge’s sewn garment Overol (Overalls, 1996) and performance documentation Bloody Day (1998), both from the late 1990s, reinforce her examination of materiality and its conceptual potential. The former piece, a pair of functional overalls constructed from sanitary pads, drapes from a clothes hanger in the middle of the gallery. The accompanying photograph shows Monge in a similar item—in this instance, pants equipped with cargo pockets—standing among callers in a row of pay phones lining the street. Visible menstrual blood punctuates her all-white ensemble like an exclamation point. Priscilla Monge, Bloody Day, 1998. Chromogenic color print, 30 x 39 ⅞ inches. Courtesy Americas Society. On the surface, this series brandishes a fundamental aspect of female biology so often cast into secrecy as if a bad habit. While society celebrates and indeed depends upon the reproductive capacity signaled by menstruation, this routine event remains confoundingly illicit—a contradiction that demands, in the words of feminist theorist Emily Culpepper, an “untangling [of] the knot patriarchy has made of this basic life experience.”1 Monge develops this line of inquiry through the formal aspects of the garments, coding within their seams a commentary on female and feminine labor. Through the image of overalls and cargo pants, the artist likens the menstrual cycle to a rough-and-rugged—albeit typically hidden—kind of work, underlining the traditionally masculine boundaries that inadequately ascribe value to labor. The preponderance of Cabezas’s defining works, installed opposite those of Monge in a long central gallery, demonstrate an equally layered conceptual approach dating back to the early 1970s. The banana—as image, as idea—recurs throughout the first phase of Cabezas’s production, which rigorously probes taxonomies of gender, nation and nationalism, commerce, and cultural identity. For her master’s thesis at Florida State University, Cabezas produced a bound manuscript whose sole utterance—“banana”—runs across every arbitrarily paragraphed page. Only in the footnotes (literally, the margins) does the artist disclose the effects of imperialist strongholds on countries labeled as so-called ‘banana republics’ through citations of post-colonial scholarship. Taking this single fruit as a potent leitmotif, Cabezas plots a complex historical terrain and questions the possibility of redress. Victoria Cabezas, Sin título (Untitled), 1973. Chromogenic print, 10 x 7 ⅞ inches. Courtesy Americas Society. Cabezas’s hand-colored images have increased in visibility with the exemplary survey Radical Women: Latin American Art, 1960–1985 (2017–18), but here, one comes to understand the breadth of the artist’s interrogation of the banana and its curious ubiquity within a larger cultural imaginary. The fruit appears as the object of “Chiquita Banana” advertising, as the subject of still lifes, and even as a plush and feathery facsimile. In a 1973 series, a male model tenderly cradles this stuffed, oversized banana in the middle of a forest. 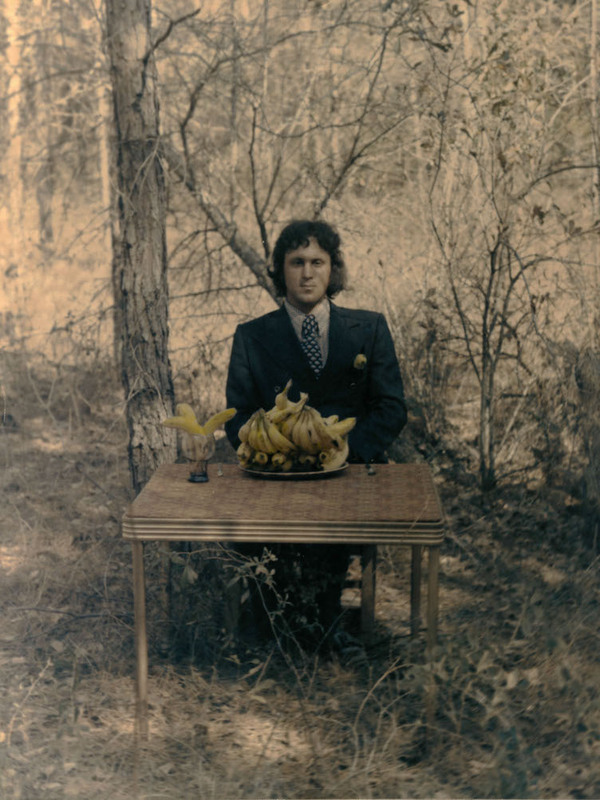 These absurd images contrast with others in which the same dark-suited man with an earnest stare clutches an over-ripened banana in his hands or sits behind a table stacked with bunches of the yellow fruit. The banana’s phallic associations only partially explain its symbolic function in Cabezas’s photographs. The artist elevates the banana, romanticized and adorned, to an object of veneration, but also constructs a stark reminder of how economic power and political control are encoded within masculine tropes. A veritable playground of patriarchal folly, this series parodies the arbitrary icons of masculinity and shows how easily they lose power when scattered across new visual fields. Yet for all the show’s strengths, little in this presentation addresses the manifold complexities of viewing this work in the United States—a country whose presence looms over both artists’ understandings of Costa Rican political and cultural autonomy. In a pocket-sized yet stimulating accompanying catalogue, artist Coco Fusco emphasizes how the construction and perpetuation of the Central American country’s idyllic reputation serves to satisfy both domestic and foreign commercial interests. “Any serious challenge to Costa Rica’s pristine image,” Fusco writes, “would be met by consternation, not only from risk-averse foreign investors but also from local elites that reap benefits by maintaining a false facade of tranquility.”3The oftentimes facile and narrow characterization of Costa Rica, feebly justified in the United States by assumptions of geographical and political primacy, greatly informs Monge and Cabezas’ presentations of their home country on the international stage. The two critically engage with these forms of neocolonialism and seek to problematize the mythologies and stereotypes they engender. 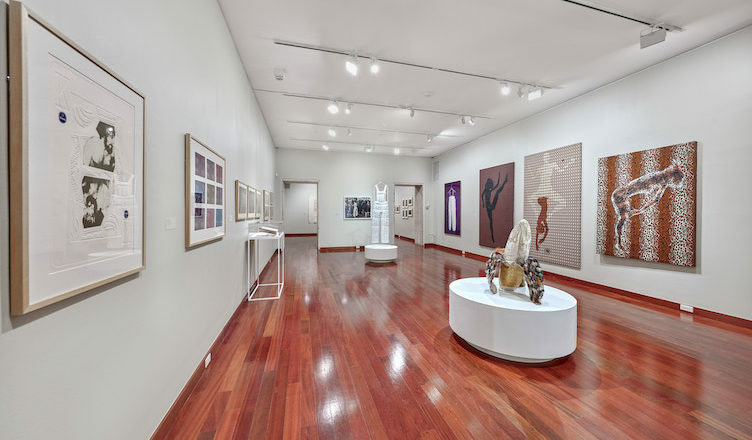 The explicit acknowledgment of these ideas in the Americas Society’s presentation may have helpfully situated how both artists grapple with the enduring legacies of colonial, patriarchal, and exceptionalist ideals. Give Me What You Ask For embraces difference in its appraisal of Monge’s and Cabezas’ highly individualized ways of working, casting both viewpoints as central to a deeper understanding of the social structures that shape Costa Rica’s past and present. The project also serves as a model for future two-person exhibitions that, taking a cue from López’s approach, might propose more fluid artistic relationships beyond those of influence, likeness, or simultaneity. Give Me What You Ask For’s thoughtful presentation favors nuanced interpretations of its protagonists while signaling the urgency of refusal in the face of a communal and claustrophobic status quo. Emily E. Culpepper, “Menstruation Consciousness Raising: A Personal and Pedagogical Process,” in Menstrual Health in Women’s Lives, eds. Alice J. Dan and Linda L. Lewis (Champaign: University of Illinois Press, 1992), 282. Miguel A. López, “Victoria Cabezas and Priscilla Monge: Our Bodies Ourselves,” in Victoria Cabezas and Priscilla Monge: Give Me What You Ask For (New York: Americas Society, 2019), 22. Coco Fusco, “Priscilla Monge: Personal Stories and Political Undercurrents,” in Victoria Cabezas and Priscilla Monge: Give Me What You Ask For (New York: Americas Society, 2019), 71. 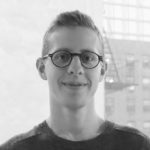 Joseph Shaikewitz is a Curatorial Assistant, Arts of the Americas and Europe at the Brooklyn Museum. He is an MA candidate in art history at Hunter College, where he focuses on Latin American art, gender, and histories of feminism in the early twentieth century.